Although the writing on this visual history blog post is in Cyrillic, these color photos are unmistakably the 1939 World’s Fair. The 1939–40 New York World’s Fair, was held at Flushing Meadows-Corona Park in Queens, NY. At 1,216 acres it was the second largest American world’s fair of all time. Only the St. Louis’s Louisiana Purchase Exposition of 1904 was larger. 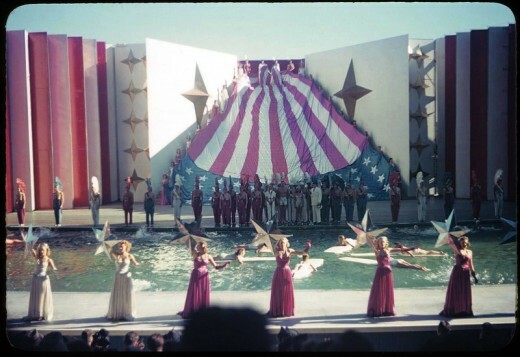 I love the pageantry that involved choreographed swim teams and huge sets. This same site would later hold the 1964 World’s Fair that featured so many Disney attractions. There is no doubt that the 1939 World’s Fair also influenced Walt Disney’s vision of how a theme park could be both welcoming and futuristic.